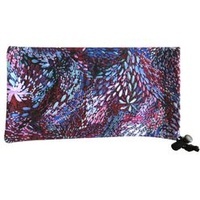 A colourful case to help protect your glasses with a matching microfibre lens cloth. Designed in Australia and manufactured overseas the hard case measures approx. 16 cm x 7.5 cm x 5 cm. The case features an Indigenous art design by artist Josie Kunoth Petyarre. A brief note about the Indigenous artist is included. A colourful way to store and help protect your glasses, a nice gift for someone overseas.